Human Development occurs all the time that a person is alive in any nation or culture. Although it is believed that the issues of development are more relevant for those who are considered to be “less developed”. The Muslim world are the second largest in the world covering mainly 1.8 Billion Muslims but torn between forces of traditionalism and modernity. Some Muslim countries are in transition due to rise of Arab spring recently. Islamic culture is very rich as it has made a very valuable contribution in human development in science and better understanding of our world. I am honoured, and deeply humbled, to the Universal Peace Federation (UPF) for inviting me on this historic occasion to discuss an important issue of Human development. From the very outset I wish to give my personal and, on behalf of the Muslim Council for Religious and Racial Harmony UK, congratulations to your organisation for the very valuable work you have done which has been very much recognised by international agencies. Human Development occurs all the time that a person is alive in any nation or culture. Although it is believed that the issues of development are more relevant for those who are considered to be “less developed”. The Muslim world are the second largest in the world covering mainly 1.8 Billion Muslims but torn between forces of traditionalism and modernity. Some Muslim countries are in transition due to rise of Arab spring recently,. Islamic culture is very rich as it has made very valuable contribution in human development in science and better understanding of our world. The study of experimental physics began with Ibn al-Haytham, a pioneer of modern optics, who introduced the experimental scientific method and used it to drastically transform the understanding of light and vision in his Book of Optics, which has been ranked alongside Isaac Newton's Philosophiae Naturalis Principia Mathematica as one of the most influential books in the history of physics, for initiating a scientific revolution in optics and visual perception. The experimental scientific method was soon introduced into mechanics by Biruni, and early precursors to Newton's laws of motion were discovered by several Muslim scientists. The law of inertia, known as Newton's first law of motion, and the concept of momentum were discovered by Ibn al-Haytham (Alhacen) and Avicenna. The concept of reaction, foreshadowing Newton's third law of motion, was discovered by Ibn Bajjah (Avempace). Theories foreshadowing Newton's law of universal gravitation were developed by Ja'far Muhammad ibn Mūsā ibn Shākir, Ibn al-Haytham, and al-Khazini. Galileo Galilei's mathematical treatment of acceleration and his concept of impetus was enriched by the commentaries of Avicenna and Ibn Bajjah to Aristotle's Physics as well as the Neoplatonic tradition of Alexandria, represented by John Philoponus. References: 1. Rüdiger Thiele (2005). "In Memoriam: Matthias Schramm", Arabic Sciences and Philosophy 15, pp. 329–331. Cambridge University Press. 2. H. Salih, M. Al-Amri, M. El Gomati (2005). "The Miracle of Light", A World of Science 3 (3). UNESCO. 5. Mariam Rozhanskaya and I. S. Levinova (1996), "Statics", in Roshdi Rashed, ed., Encyclopedia of the History of Arabic Science, Vol. 2, pp. 614–642 . Routledge, London and New York. 6. Abdus Salam (1984), "Islam and Science". In C. H. Lai (1987), Ideals and Realities: Selected Essays of Abdus Salam, 2nd ed., World Scientific, Singapore, pp. 179–213. 7. Seyyed Hossein Nasr, "The achievements of Ibn Sina in the field of science and his contributions to its philosophy", Islam & Science, December 2003. 8. a b Fernando Espinoza (2005). "An analysis of the historical development of ideas about motion and its implications for teaching", Physics Education 40 (2), p. 141. 9. Seyyed Hossein Nasr, "Islamic Conception Of Intellectual Life", in Philip P. Wiener (ed. ), Dictionary of the History of Ideas, Vol. 2, p. 65, Charles Scribner's Sons, New York, 1973–1974. 11. Shlomo Pines (1964), "La dynamique d’Ibn Bajja", in Mélanges Alexandre Koyré, I, 442–468 [462, 468], Paris. 12. Robert Briffault (1938). The Making of Humanity, p. 191. 13. Nader El-Bizri (2006), "Ibn al-Haytham or Alhazen", in Josef W. Meri (2006), Medieval Islamic Civilization: An Encyclopaedia, Vol. II, pp. 343–345, Routledge, New York, London. 14. Mariam Rozhanskaya and I. S. Levinova (1996), "Statics", in Roshdi Rashed, ed., Encyclopaedia of the History of Arabic Science, Vol. 2, p. 622. London and New York: Routledge. 15. Galileo Galilei, Two New Sciences, trans. Stillman Drake, (Madison: Univ. of Wisconsin Pr., 1974), pp. 217, 225, 296–7. We don't need to be shy or silent any longer about the many contributions to science, medicine, economics and general progress for all humanity made by Muslim scholars throughout history. Let's all work together to share this important, historical information with others before if becomes pushed aside and forgotten. The chronology presented here gives an understanding of the time difference and generation gaps of famous names in early Islamic history, e.g., Imam Abu-Hanifah was early enough to have seen Sahabah, while Imam Malik, Imam Shafi'i, and Imam Ahmad bin-Hambal had not met or seen any Sahabah. Compare the time frame of Imam Bokhari & Imam Muslim with those of Imam Malik or Imam Abu-Hanifah. See the times of 12 Imams of Isna-'ashari faith (The Twelvers). Up to the time of Imam Ja'far Sadiq, friends of Ali (Shi'aan-e-Ali) were not considered any different from other Muslims. Imam Ja'far Sadiq had two sons, Isma'il and Musa al-Kazim. Followers of Isma'il become the "Seveners" or "Ismailis. Followers of Musa al-Kazim become the "Twelvers" who believed that the lineage of Imam continued with Imam Musa al-Kazim. Beginning of Shi'ism was not documented before this time, but long after, when the concept of 12 Imams became the basis of Shi'as after the 12th Imam's disappearance in 878 CE. Son of Imam Hasan Askari. Followers of Isna-'ashari faith (The Twelvers) believe that he is still alive, hiding, and will re-appear near Judgment Day to establish Kingdom of Allah, to fill the world with equality and justice. Chronology for Caliphs from Sahabah is basically taken from "Khilafate-e-Islamia" by Abdul-Quddoos Hashmi, Page 29. Isna-Ash'ari Imams chronology is basically taken from "Millat-e-Islamia ki Mukhtasar Tareekh" by Sarwat Saulat, Page 157. Chronology for Fiqh Imams is taken from "Tazkira Imam Abu-Hanifah" by Jamil Ahmad Sharqpuri, various pages. The Quran exhorts the Muslims to scientific research: "And whoso bringeth the truth and believeth therein such are the dutiful." (Translation of Qur'an 39:33) Every Muslim man's and every Muslim woman's prayer should be: "My Lord! Enrich me with knowledge." (Translation of Qur'an 20:114) The pursuit of knowledge and the use of reason based on sense of observation is made obligatory on every Muslim man and woman. The following traditions of the Prophet (peace be upon him) supplement the foregoing teachings of the Qur'an in the following way: Seek knowledge "even though it be in China". "The acquisition of knowledge is compulsory for every Muslim, whether male or female." "The ink of the scholar is more sacred than the blood of the martyr." "Seek knowledge from the cradle to the grave." "God has revealed to me, Whoever walks in the pursuit of knowledge I facilitate for him the way to heaven". "The best form of worship is the pursuit of knowledge." "Scholars should endeavour to spread knowledge and provide education for people who have been deprived of it. For, where knowledge is hidden, it disappears." Someone asked the Prophet (peace be upon him) : "Who is the biggest scholar?" He replied: "He who is constantly trying to learn from others, for a scholar is ever hungry for more knowledge." "Seek for knowledge and wisdom, for whatever the vessel from which it flows, you will never be the loser." "Thinking deep for one hour (with sincerity) is better than 70 years of (mechanical) worship." "Worship without knowledge has no goodness in it and knowledge without understanding has no goodness in it." And the recitation of the Qur'an, which is not thoughtful has no goodness in it. "To listen to the words of the learned and to instill unto others the lessons of science is better than religious exercises." "Acquire knowledge: it enables its possessor to distinguish right from the wrong, it lights the way to heaven; it is our friend in the desert, our society in solitude, our companion when friendless; it guides us to happiness; it sustains us in misery; it is an ornament among friends and an armour against enemies." Prophet Muhammad (peace be upon him) was able to unite the Arab tribes who had been torn by revenge, rivalry, and internal fights, and produced a strong nation, that acquired and ruled simultaneously the two known empires at that time, namely the Persian and Byzantine Empires. The Islamic Empire extended from the Atlantic Ocean on the West to the borders of China on the East. Only 80 years after the death of their Prophet the Muslims crossed to Europe to rule Spain for more than 700 years. The Muslims preserved the cultures of the conquered lands. The Islamic Empire for more than 1,000 years remained the most advanced and civilized nation in the world. This is because Al-Islam stressed the importance and respect of learning, forbade destruction, developed in Muslims the respect for authority, discipline, and tolerance for other religions. The Muslims recognized excellence and hungered intellectually. The teachings of the Qur'an and Sunnah drove many Muslims to their accomplishments in sciences and medicine. By the 10th century their zeal and enthusiasm for learning resulted in all essential Greek medical and scientific writings being translated into Arabic in Damascus, Cairo, and Baghdad. Arabic became the international language of learning and diplomacy. The centre of scientific knowledge and activity shifted eastward, and Baghdad emerged as the capital of the scientific world. The Muslims became scientific innovators with originality and productivity. The rise of Muslims to the zenith of civilization lasted over a thousand years. During this millennium Muslims contributed vastly to the enhancements of arts, science and cultural growth of mankind. For example Islamic medicine is one of the most famous and best known facets of Islamic civilization, and in which the Muslims most excelled. The Muslims were great torch-bearers of international scientific research. Some of the best and most eloquent praises of science ever written came from the pens of Muslim scientists who considered their work to be acts of worship. The same motives led to the establishment of Al-Azhar (800 C.E), the first university in the world. They hit the "source ball of knowledge" over the fence to Europe. In the words of Campbell, "The European medical system is Arabian not only in origin but also in its structure. The Arabs are the intellectual forbearers of the Europeans." In fact the Muslims are directly responsible for the European Renaissance. At the apex of its glory around the 10th century Cordoba, the Capital of Muslim Spain, had pavements, street lighting, three hundred public baths, parks, palaces, one hundred thousand houses and seventy libraries. There were close to half a million books in a single library whereas the whole of France contained much less than this figure. The Muslim physicians performed complicated eye surgery 600 years earlier than in Europe. The Muslim scientists used paper 200 years before Europe, they had paper mills, banks, police stations and invented spherical trigonometry (indispensable for space sciences) in the late 10th century, solved equations of the third and fourth degree, binomials to the nth degree, and developed differential and integral mathematics. They discovered the force of gravitation, blood circulation, laws of motion, and even developed the theory of evolution and taught it in their universities. They measured the circumferences of the earth and value for specific gravities correct to three decimal places almost a thousand years ago. There is hardly a field of knowledge where Muslims did not research, think, or investigate and explore or invent something exemplary. The status of the Muslim Ummah is of great concern to all the Muslim intellectuals. No one can deny that the Muslim Ummah occupies a position which is at the lowest rung of the ladder in the world. The share of the Muslims in Nobel Prizes and the Olympic Games is close to nothing. Muslims contributions to literature both general and scientific is marginal at the best. It is very sad to see the status of Muslims in the present world at the bottom. Muslims have been economically exploited and politically subjugated. Economically, Muslims are poor; in education they are backward; and in science and technology they are marginal. Even very small countries export arms, medicine and technology to the Muslim countries. The average literacy rate is around 38 per cent and in rural areas in Muslim countries, the illiteracy rate among Muslim women is 93 to 97 per cent. This is contradictory to the message of the Quran and Prophet Muhammad (peace be upon him) as mentioned earlier. The Muslims educated in the western world know about Western books and scholars but they know very little about Muslims books and the intellectual achievements of the Muslims. The mean rate for literacy for the Muslims is 35 per cent lower than that for the Third World, and 40 per cent below the worlds average. The data suggests that almost two-thirds of the Muslims worldwide are illiterate. This low level of literacy, evidently, is responsible for the grinding poverty, the backwardness, and the deplorable conditions under which the vast majority of the Muslims live at present. Pakistan is the most advanced Muslim country in science and technology among Muslim nations. However, the literacy rate for Pakistan, home to the second largest Muslim Ummah in the world, ranks the lowest among the most populous nations, is even below the average for the Muslim nations. What is shocking is India the second most populous nation in the world, has a significantly higher rate of literacy than Pakistan and Bangladesh. At one time the three countries constituted a single country (British India) with a literacy rate of 12 per cent on the eve of the partition in 1947. Philosophy, Physics, Optics, Medicine, Mathematics, Metallurgy. Mechanics of Flight, Planetarium, Artificial Crystals. Medicine, Ophthalmology, Smallpox, Chemistry, Astronomy. Sociology, Logic, Philosophy, Political Science, Music. Political Science, Sociology, Jurisprudence, Ethics. Philosophy, Medicine, Mathematics, Astronomy, Poetry, Music. Geography (World Map, First Globe). Philosophy, Law, Medicine, Astronomy, Theology. Second wave of devastation of Muslim resources, lives, properties, institutions, and infrastructure over a period of one hundred and twelve years. Crusader invasions (1217-1291) and Mongol invasions (1219-1329). Crusaders active throughout the Mediterranean from Jerusalem and west to Muslim Spain. Fall of Muslim Cordoba (1236), Valencia (1238) and Seville (1248). Mongols devastation from the eastern most Muslim frontier, Central and Western Asia, India, Persia to Arab heartland. Fall of Baghdad (1258) and the end of Abbasid Caliphate. Two million Muslims massacred in Baghdad. Major scientific institutions, laboratories, and infrastructure destroyed in leading Muslim centers of civilization. Refer to "A Chronology of Muslim History Parts III, IV." World Traveler. 75,000 mile voyage from Morocco to China and back. Sociology, Philosophy of History, Political Science. Third wave of devastation of Muslim resources, lives, properties, institutions, and infrastructure. End of Muslim rule in Spain (1492). More than one million volumes of Muslim works on science, arts, philosophy and culture was burnt in the public square of Vivarrambla in Granada. Colonization began in Africa, Asia, and the Americas. Refer to "A Chronology of Muslim History Parts IV, V (e.g., 1455, 1494, 1500, 1510, 1524, and 1538)"
Two hundred years before a comparable development elsewhere, Turkish scientist Hazarfen Ahmet Celebi took off from Galata tower and flew over the Bosphorus. Logari Hasan Celebi, another member of the Celebi family, sent the first manned rocket, using 150 okka (about 300 pounds) of gunpowder as the firing fuel. Tipu, Sultan of Mysore [1783-1799] in the south of India, was the innovator of the world's first war rocket. Two of his rockets, captured by the British at Srirangapatana, are displayed in the Woolwich Museum Artillery in London. The rocket motor casing was made of steel with multiple nozzles. The rocket, 50mm in diameter and 250mm long, had a range performance of 900 meters to 1.5 km. The dates in the table are converted from the Islamic calendar (A.H.) which begins with Hejira, the migration of Prophet Muhammad (s) from Makkah to Medinah. The calendar is based on lunar monthly cycles. 1 A.H. = 622 C.E. Students in Western Universities might have heard that Muslims were once leaders in science, but their accomplishments are often belittled, and their scientists are reduced to but borrowers who translated Greek and Persian works then assumedly hid them on a bookshelf so the West can later expand and build on them once it awakes from its sleep during the dark age. Donald Cardwell, in the Fontana History of Technology, claims that technologies imported into Europe during the Dark Ages “originated in China and India and were merely passed on by the Arabs.” While cultural bigotry plays a major role in this distortion of the facts, the achievements of the Muslims have been left out of Western historical records as a result of the hatred of Islam embedded in the Judeo-Christian world, which shall be traced to many factors. Before thoughtlessly calling out “conspiracy” as many Muslims today so often do, one must show that the Muslims actually did have an integral role in scientific development. Due to the wealth of achievements, however, this is not very hard to find. The Muslims made numerous advances in many fields, one the most important being physics. They received the physics texts of the Greeks, then translated, corrected, and expanded on them greatly. The basis of the study of optics can be attributed directly to the Muslims. Al-Hassen bin Al-Haythem is considered the founder of this field. He and Al-Beirouni also logically came to the conclusion, in disagreement with Aristotle, that the speed of light is constant and that light is composed of extremely small particles moving at extremely high speeds, which is the basis of the quantum nature of light, an endlessly celebrated tribute to 20th century science (Mahmoud 112-113; Davies 29). Muslim scholars also laid the foundations of mathematics. Muslims were the first to recognize the importance of and use the zero effectively, borrowed from the Indians, bringing to Europe what is now called “Arabic numerals”. Otherwise, the scientists and mathematicians of Europe would probably still be counting on their fingers or fumbling with clumsy roman numerals when analyzing data. Muhammad bin Mousa Al-Khawarizmi is considered the founder of modern algebra, and the mathematicians that followed made ever more impressive contributions. Ghiath Edden Al-Kashi, approximated pi to 16 places past the decimal point. The system know as Pascal’s triangle, which assists in factoring equations in the form of (a + b)n, was developed by Al-Karkhi, and not Louis Pascal. Later Muslim mathematicians were able to factor equations as complex as fourth degree equations; fifth degree equations are impossible to factor. (Mahmoud 137-147) The contribution of Muslim mathematicians to algebra is integral to the development of all sciences as mathematics is frequently referred to as the language of science. Newton would have had quite a difficult time quantitatively describing his laws of motion without using the algebra first implemented by the Muslims. Among the marvels of the medical affairs on incident is this that Sahib Munitrah wrote to his uncle that there was need of a doctor to treat his companions. My uncle sent a Christian doctor, Thabit, to them, but he came back within ten days. We asked him, “Have you been able to treat the patients in such a short period?” He said, “They had brought to me a soldier who had a boil on one of his feet. When a bandage dipped in the juice of Linjah (a plant) was applied, the abscess got burst. There was another patient, a woman whose dry and chapped skin had developed itch and was giving her trouble. I kept her on a restricted diet as a preventive and tried to make her dry skin moist. But suddenly an English doctor appeared on the scene and told the people there about me, “What does he know of medical science and treatment of patients?” Then he asked the soldier with the abscess on his foot whether he would like to live with one leg or die with both. The soldier said he would prefer to live with one leg only. So the soldier and a sharp axe were brought and I was witness to this scene. The English doctor straightened his leg on a wooden board and asked the soldier (executioner, Tr.) to chop off his leg with a single stroke of his axe. He made a stroke with the axe, and I was a witness to that, and found that it failed to sever the leg. So he made a second attempt. The bone marrow was thrown out and the patient died immediately. While historians have written many books on the high level of sophistication and learning of the Muslims compared to the Europeans during the dark ages, few have thought to make the connection between Muslim science and the scientific explosion that was to occur later in Europe. The dependence of the latter on the former, however, is immense. It would not be controversial to say that the scientific revolution that took place in 17th Europe could not have occurred without the help of the Muslims. However, a perplexing relationship existed between the Muslim world and Europe. It was not one of mutual reverence and respect, nor was it one of a father-culture, daughter-culture nature. There was an overpowering sentiment of hate embedded in European culture that outweighed any benefit or advancement the Muslims would give to them. This fear would turn into hate and aggression as Europe regained its strength. The Muslims also would serve as a means for Europe to do so. These “pagans” as Europeans saw them, would be the perfect enemy for Europeans to rally together. They did so, quite pathetically, in the crusades. The crusades, in terms of human losses, were one of the most lopsided military campaigns in history, with the exception of the savage massacres of Muslim civilians by the Christian armies. However, the crusades, initially being a crushing defeat for the Christians, would introduce them to the enormity of the gap between them and the Muslims. One may ask after looking at the reasons why Muslim scholars are vastly undervalued in Western books is “Why should we care now?” The scholars are dead. The ink in the history books has dried. What good will it bring Muslims, besides a headache, to raise this issue now? It is done to restore confidence to the Muslim Ummah, to remind believers what is needed to be great again. The Muslims ruled from France to India, not only because of being blessed with the true message, but also of being superior to the conquered people in all other “worldly” ways. The Muslims would have never conquered the Persians without superior military planning and tactics. The people of the Roman Empire in greater Syria and North Africa would have never converted to Islam if the Muslims were not materially superior to the Romans. The Khatib who gives the Friday sermon, who believes that Muslims will become great again once they start using their miswaks more often, is missing the whole story. Islam does not spread through prayer and piety—people go to the Jannah through prayer and piety. Islam provides a system that allows individuals to reach their fullest potentials in this life, and to encourage worship that allows individuals to reach their fullest potentials in the next. Studying the lives of the Muslim scholars also provides modern-day Muslims with a portrayal of the prototypical modern scientist. He is one who devotes his efforts to discovering Allah’s signs in this world and who tries to direct his or her discoveries those that produce social benefit. Armstrong, Karen. “Holy War: The Crusades and their Impact on Today’s World”. Doubleday: New York, 1991. Davies, Paul. “Superforce: The Search for a Grand Unified Theory of Nature”. Penguin: London, 1995. Eaton, Gai. “Islam and the Destiny of Man”. The Islamic Texts Society: Cambridge, 1994. Mahmoud, Yusuf. “Al-Injazat Al-Ilmiyya fil Hadara Al-Islamiyya”. Dar Al-Bashir: Amman, 1996. Reichmann, Felix. “The Sources of Western Literacy: The Middle Eastern Civilizations”. Greenwood Press: Westport, Connecticut, 1980. Said, Edward. “Orientalism”. Routledge & Kegan Paul: London, 1978. Shustery, A. M. A. “Outlines of Islamic Culture”. Sh. Muhammad Ashraf: Lahore, 1976. This page was done for my “Scientific Legacy in Islam” (Turath al-‘Ilmi al-Arabi al-Islami) course that I took for the summer at the University of Jordan. All good is from Allah, all misinformation is from me. 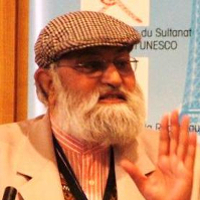 Chairman Taskforce for European Inter-cultural Dialogue; Deputy President and International Secretary World Congress of Faiths (WCF); European Representative of World Council of Muslims Inter-faith Relations (WCMIR); Vice Chair MCB Inter-faith Relations Committee and Adviser to the Muslim Council of Britain (MCB) Europe and International Affairs Committee - (MCB EIAC) and founding member of MCB since 1997.